Everyday we go to work, we go to school, we hang out with friends and we go shopping. What if i tell you that you can actually own the shopping malls you go to, own the restaurants you patronise, own the retail outlets you buy clothes from, own the hospitals you visit, own the bus and MRT you ride everyday and even own the airlines you travel on? It is possible through a financial intermediary called the stock market. When a company is listed on the stock market, it becomes a public company. Many shareholders collectively own a part of the company and are entitled to a share of the income through dividends distribution. It is no longer a private company once it is listed. The surprising thing is all these companies on the stock market are actually all over the streets which we walk on. Well, maybe not so surprising to people who already know but it is to people who live everyday without knowing. Many people ask how do i know which company to invest in if i want to start investing? 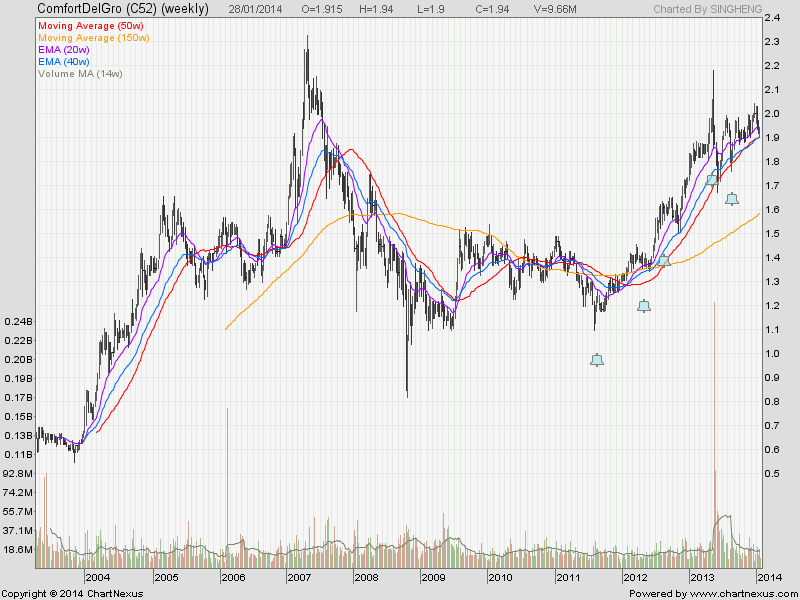 Do i look through the SGX website and scan from A to Z? The answer is no. You don't have to do that. You just have to open your eyes to see it on the streets. Which are the companies on the streets? Imagine how you would live your daily life. You get out of your house and take the bus. 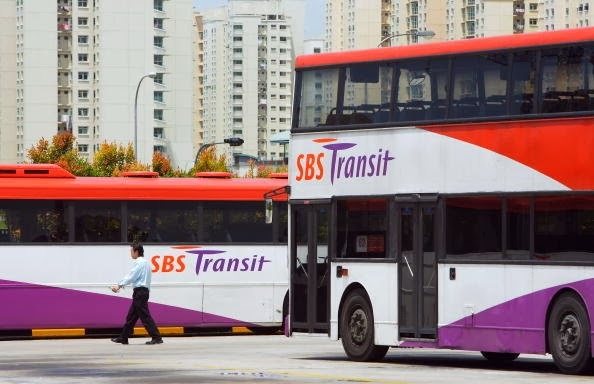 It's a sbs transit bus. 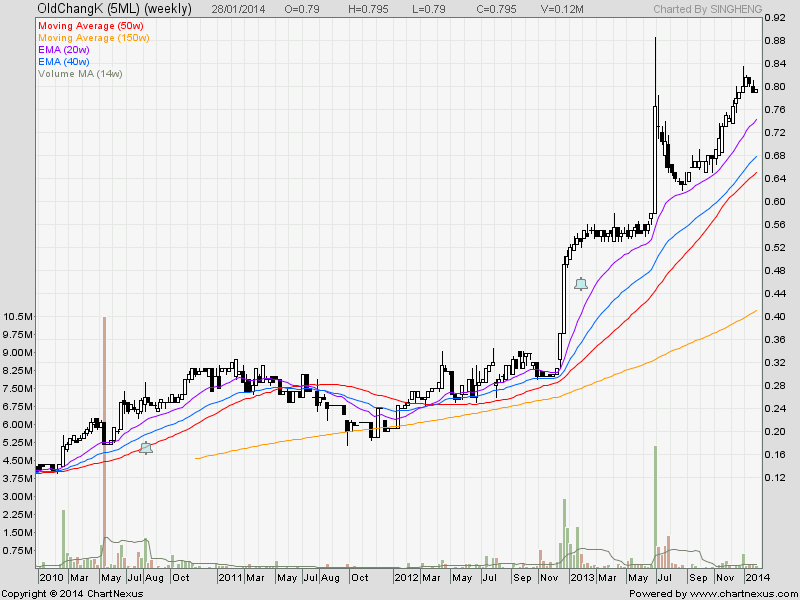 This company is owned by comfort delgro. You reach the MRT station and transfer to take the MRT. 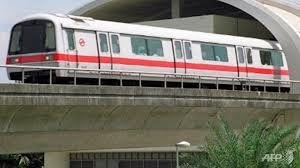 The MRT is operated by SMRT. You buy a straits times newspaper and proceed to read the daily headline news. 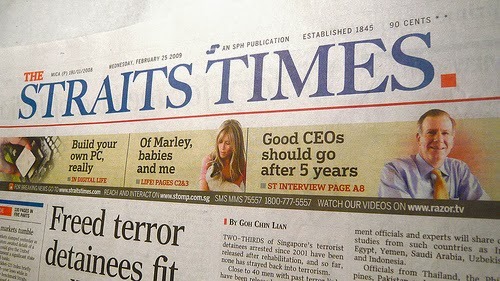 The newspapers are published by Singapore Press Holdings(SPH). Your mobile phone rings and you pick up a call. This service is managed by either of the three telcos in Singapore, Singtel, Starhub and M1. 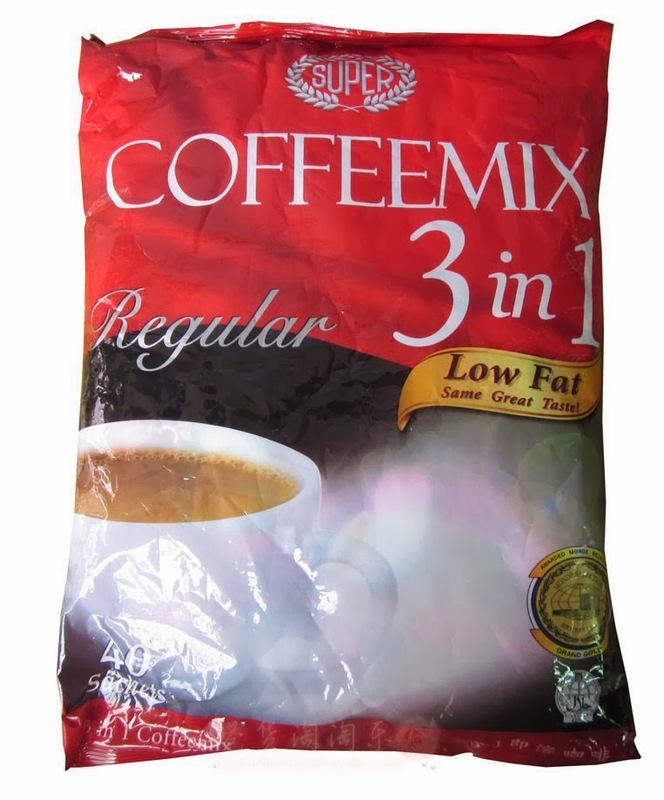 You reach your office and make your daily favourite 3 in 1 coffee. The coffee sachet has the word super on it. This coffee is manufactured and produced by Super group Your company is kind enough to buy you some curry puffs for breakfast. Those are from old chang kee. 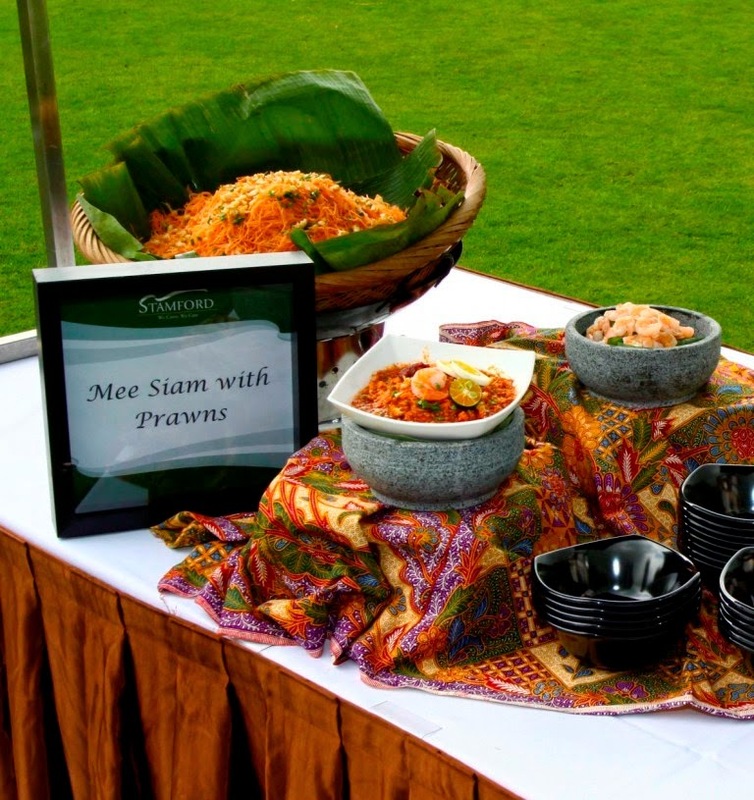 During lunch time, your company catered buffet from Stamford catering. This catering service is provided by Select group. After work, you meet your friends for dinner at Din Tai Fung. 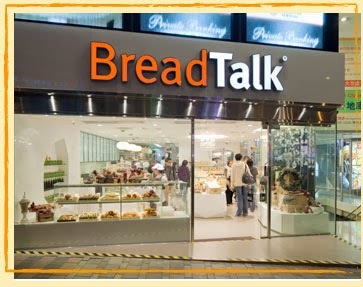 This company is owned by Breadtalk. You go shopping at G2000 and Uniqlo after dinner. These 2 companies are owned by Wing Tai. You're at the newly opened Bedok Mall. 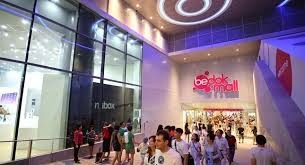 This shopping centre is owned by CapitaMalls Asia. You're so tired after a long day and hailed a taxi to go back home. 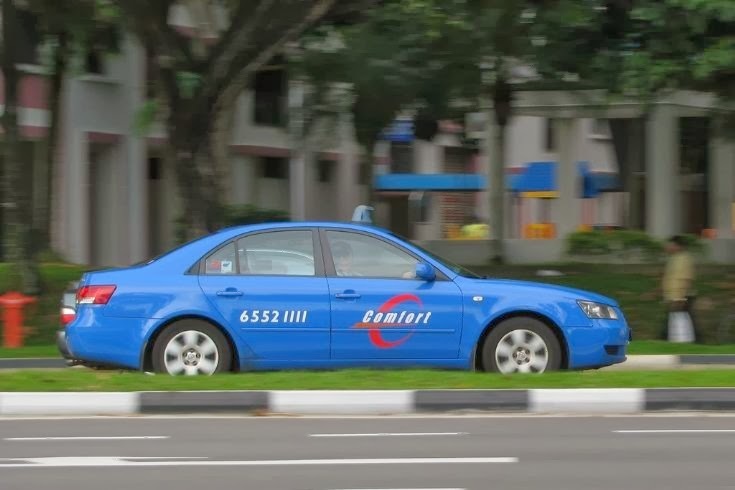 The taxi is called comfort and it is again owned by comfort delgro, similiar to the morning bus that you took. Does this life sound familiar to you? That's it. You have just found 10 companies without even looking at the stock price on SGX or any stock screens on your computer or TV. The good news here is: You can own a part of all the above companies. In just one day, you would have discovered 10 listed companies in Singapore if you had looked carefully enough. Some people would even have used the services and products of more than 10 companies in a day. Think about it, wouldn't it be good that you can receive a part of the expenses you spend on back into your pockets? This is just like having rebates and discounts for the things you buy. In actual fact, when it is done correctly, you can even enjoy the things free of charge for many years to come. But hold on, you don't just go back and buy the company through your stock broker immediately. There's more to it. We'll get to it later. This is the power of investing. You can own a part of your everyday life! Is it possible to get free products and services for many many years? This idea of investing by looking at companies on the streets was introduced by Peter Lynch in his book "One up on wall street". He wrote about how his wife was commenting on how good a departmental store was and later on this company's stock price went up many many times. Let's look at some companies in Singapore which you might potentially have free stuffs for many many years if you've bought their stocks. This is a company we're familiar with. I first heard of it as a bread that talks. They were rapidly expanding and more and more stores opened up. When the company was first listed on the Singapore stock exchange in 2003, its offer price was 24cents. Now the price is 90cents which means it has increased by almost 4 times. Putting it in numbers, this means a $5000 invested in 2003 will become $18,750 now. This is a profit of $13,750. How many breads can you buy with this money? The answer is around 9000 breads if each bread cost $1.50 on average. This company owns the popular comfort taxi, the comfort driving centre and 75% of the SBS buses that we take. What you may not know is this company not only operates transport services in Singapore but also other parts of the world. This includes, UK, China, Australia, Malaysia, Ireland and Vietnam. If you had bought their shares in 2011 at the low of $1.10, now you would have made almost double your money. A $5000 investment in 2011 will become almost $10,000 in 2013. This $5000 profit would have more than offset the many fare increases over the years. Maybe if everyone had invested in the transport operator and got dividends as well as profits, they wouldn't have complaint on the fare increase. 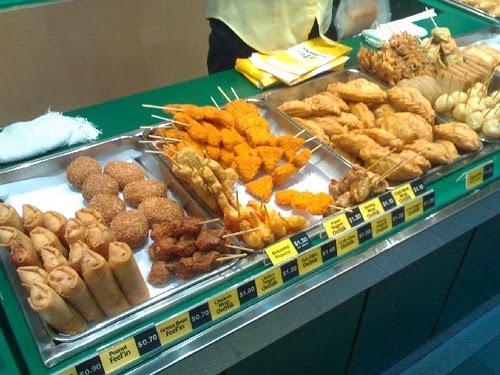 Who would have thought that a small store selling curry puffs can be so successful today? They are literally seen everywhere in Singapore now. Don't you agree? Its share price in 2011 was 19cents at the low. 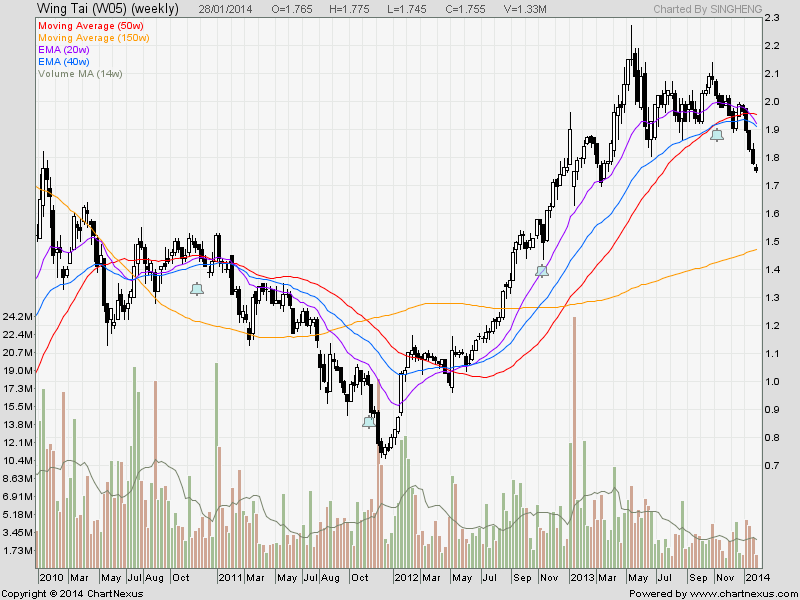 Now, its share price is worth 80cents. That's a 4 times increase in about 3 years. A $5000 invested in Old Chang Kee in 2011 will become $20,000 today. That's a profit of $15,000. Curry puffs getting more expensive? Not to worry, that $15,000 can buy you many many curry puffs for many years ahead. Not forgetting dividends are still paid every year which means more free curry puffs. As stated earlier, Wing Tai owns G2000 and the Uniqlo retail outlets. To be exact, Wing Tai owns 45% of G2000 and 49% of Uniqlo. It's shares was trading at a low of 73cents in 2011. Currently the price is around $1.80. That's a 2.5 times increase. The profits from the investment can buy you lots of office wears for work, winter clothes for your holidays and even your everyday casual wears. 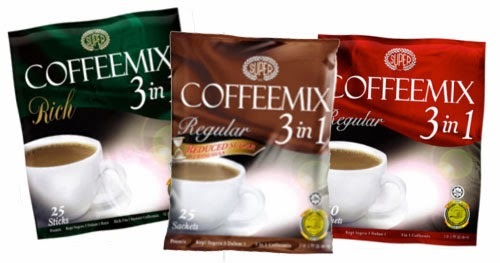 This is the company that made the 3 in 1 instant coffee. I've read their success story somewhere before. Maybe i'll write up on its success story in another blog post. 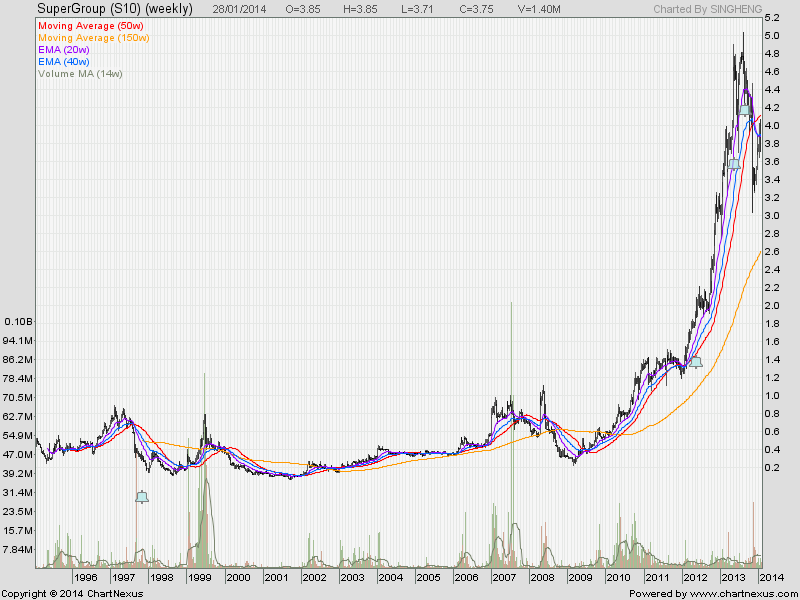 Now, this stock went up 50 times which means a $5000 investment in 2011 would have become $250,000 now. Who says there are no 50 baggers among Singapore stocks? However, to realised the whole value of the 50 bagger, you'll have to wait for 10 years. If you did not have patience to wait through 10 years and sell beforehand, it would most probability be a 4 or 5 bagger only. Some people may say its already very good! Is it that easy to make money? The profits listed above are exaggerated. The truth is very few people are able to buy at the bottom and sell at the top. These are just some examples of everyday companies which would have made you lots of money even if you did not buy at the bottom or sell at the high. The fact is investors do not try to buy at the bottom. They accumulate along the way as long as the company's fundamentals remain intact and outlook remains positive. Any weakness in the market itself presents an opportunity to buy more. We've discussed on how to pick the companies on the streets. We've discussed on the free stuffs you can potentially get. Now the most important question is when do i buy them? Once you discover the companies, you should not just buy them immediately at the current price. The key is in finding the value of the company and buy at a discount to its value. This is what we call the margin of safety(MOS). This I will discuss more in depth after the Chinese new year holidays. In the next part of this series on buying the company on the streets, we'll evaluate how much a company is actually worth? Is it worthwhile to buy the company at the current price? How to buy the company at a discount? Stay tune!! 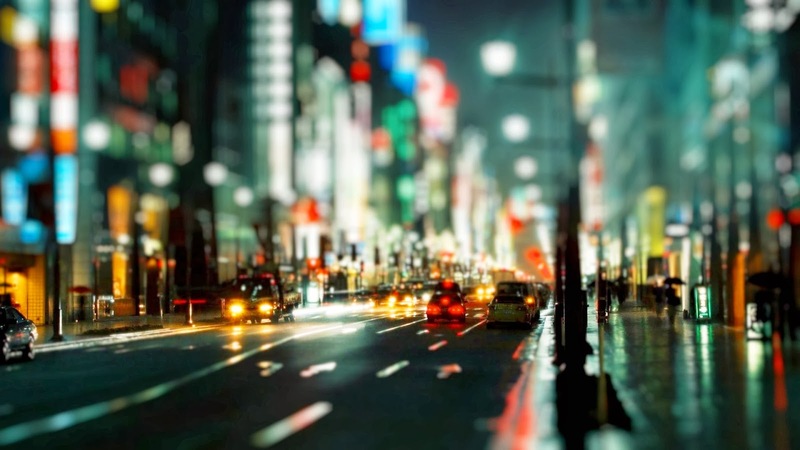 Read Part 2 of this series here: Buying the company on the streets (Part 2) - When to buy? In the meantime, enjoy the Chinese New Year celebrations with good bonding time with your family and friends as well as all the good food. Here's wishing everyone a prosperous chinese new year ahead. May we HUAT(prosper) even more in the year of the horse!! We've heard that there is a property bubble in Singapore as well as other parts of Asia like Hong Kong, China etc. How about the stock market? Is the stock market in a bubble too and where will the market head from now onwards? Last week, US markets declined greatly with the Dow Jones down more than 300 points on Friday. With this, Asian markets today also followed suit with major stock market indices on a decline. I have to ask myself this question:"Do i stay invested or do i sell away my stocks". Will the stock market crash? These are the questions which many people would ask. For me, i cannot predict the market. I also do not care where the market will go from here. Trying to predict the next direction of the market is liken to fortune telling of a person's future. In other words, it is almost impossible. It is also worthless to always wanting to predict the future while you do not do anything to your current circumstances. It's like a poor man trying to predict if he will be rich in the future but does not do anything now. I hope you get what i mean. I sense that the market sentiment now is still on a wait and see attitude. Many people want to invest only when everything is good and rosy. Among my friends and relatives, very few of them are in the market also. When there are discussions on the stock market, many are afraid of losing money and investing at the wrong time. To me, there is no perfect time and it is futile to time the market. So if I do not care about the future direction of the market, what do i care about? As a shareholder of a company, i'm interested in the business prospect of the company. I want to see the management keeping their promise, managing the company well and increase shareholder's value. It doesn't matter if the stock price goes up or down unless the fundamentals of the company changes. This is the key point we must focus on. Singapore has embarked on a series of major infrastructure projects among those are the on going new MRT lines which will continue till 2030, the new changi airport 4 & 5, the new marina bay CBD. Will Singapore stop all these infrastructure projects in the near future? The most probable answer is no. Investing in those companies might be a good choice. US tapering and interest rates at record low? In the current situation, interest rates can only go up as it cannot go lower any more. The obvious choice is to stay away from interest rates driven sector like companies dealing with properties. 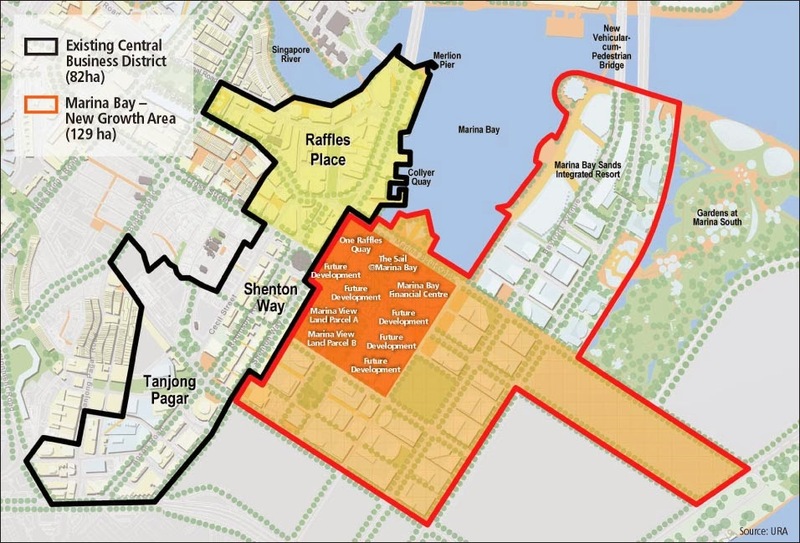 The Singapore government really does seem determined to keep property prices stable. A correction is expected if not more people are going to complain that prices are too expensive. Japan's government on the other hand is determined to inflate their prices with a 2% inflation target. With huge amount of capital injection into Japan's economy, we expect to see prices going up and hopefully this will end the decade long deflationary economy which they have experienced since the 1990s. To ride on this, investing into Japan's property might be a wise choice. 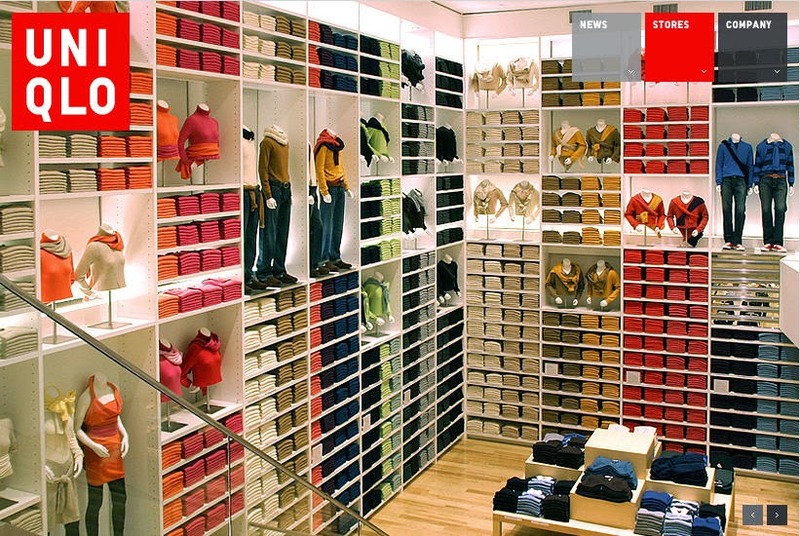 Rental of retail spaces as well as residential spaces might also increase as the economy recovers. 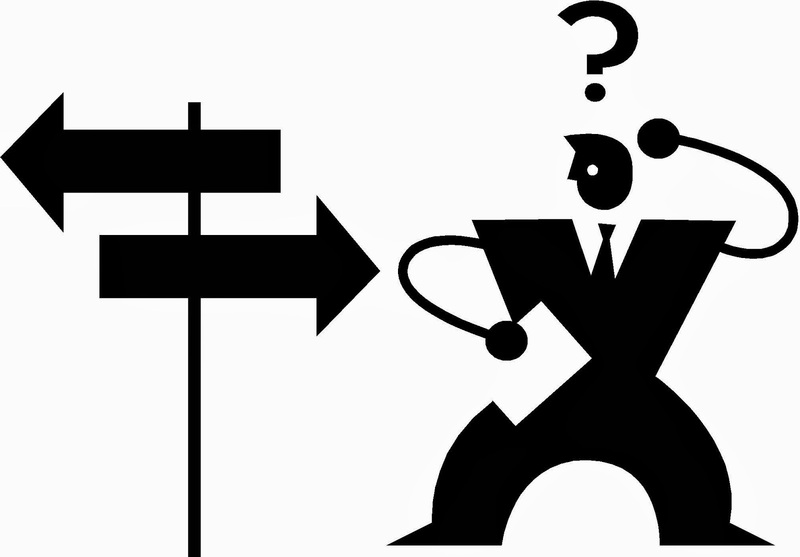 Looking at individual company's business is a better choice than looking at their stock prices. Stock prices goes up and down and it doesn't matter as long as the value of the company doesn't change. 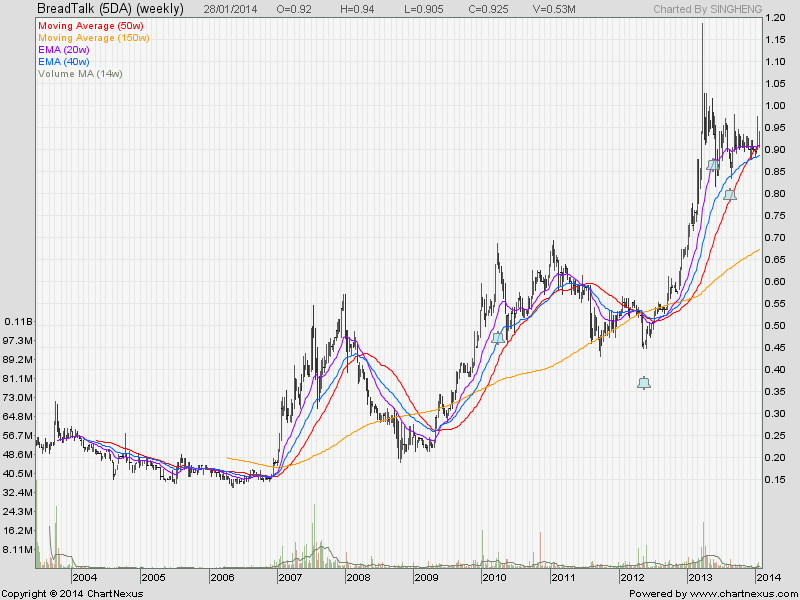 If the stock price does decline while the company's value remains the same, it is a good chance to accumulate more. The important thing is to buy the company at reasonable value relative to its stock price. For example if i know the company has this amount of assets and cash and i can buy this company at a lower value than what it is actually worth, i would have found myself a good bargain. We all like discounts don't we? We do not have control over the stock price or market movements but what we can do is to use the bad mood swings of Mr Market to our advantage. Not many people are investing in stocks now. I don't see the uncles and aunties at the coffee shop talking about the latest stock tips and sharing their experiences of making huge fortunes in the market. It doesn't seem like there is a stock market bubble at all when it's not hot at all. For the property market, it's another story. What once happened inside the showrooms was scary as people snap up units after units of million dollars condos. Perhaps some of you have experienced the euphoria of the crowded showrooms. This euphoria will come to an end soon. In fact, it might actually have ended. This series was shown on Channel 5 where many successful individuals go undercover for 2 days to experience the life of an underprivileged family in Singapore. In this particular episode, CEO of Propnex, Mohamed Ismail, goes undercover to know more about the life of an underprivileged family. The family is poor but the children are still sensible to be contented that they have food on the table even though its only 1 dish for 2 meals a day. They don't have extra money to have better food. This family does not have the chance to travel abroad and the shocking thing is they don't even have money to make a passport. Forbes magazine regularly comes out with a list of richest people in the world and they've come out with a list of Asia’s youngest billionaires for 2013. On the list are Gree’s Yoshikazu Tanaka from Japan and Fang Wei of Fangda International Industrial Investment of Beijing in China. Forbes also came out with a similar list in 2008, which included several billionaires like Ma Huateng of Tencent Holdings from China and Chu Lam Yiu from Hong Kong. These young, self-made billionaires serve as an inspiration to anyone who believes that hard work—and a bit of cleverness—can indeed make you rich. Japanese entrepreneur and self-made bilionaire Yoshikazu Tanaka founded social network game site Gree when he was just 26. He has had the distinction of being called “Asia’s Youngest Self-Made Billionaire” by Forbes in 2010. Gree has grown big enough to acquire other companies, including Atlantis Co., Ltd., US social mobile gaming platform OpenFeint, and mobile game developer Funzio. His net worth is estimated to be at $1.9 billion as of April 2013. Self-made billionaire Fang Wei’s net worth is estimated to be at $1.3 billion according to Forbes. Fang Wei chairs Fangda International Industrial Investment of Beijing. A profile from Bloomberg says that the company invests in carbon, iron, steel, real estate, and pharmaceuticals. Ma Huateng co-founded Tencent in 1998. Today, the internet company’s QQ instant messaging tool is very popular in China. Tencent is also currently involved in other businesses including e-commerce and online games. Forbes estimates Ma’s net worth to be a staggering $10.2 billion as of October 2013, up from $6.4 billion from the previous year. Time Magazine named him one of the world’s most influential people in 2007. Chu Lam Yiu chairs fragrances and flavourings company Huabao International. Her fortunes may have fallen a bit since her Hong Kong listed company’s shares dropped, but Forbes estimates her net worth to be at around $1.7 billion as of October 2013. According to a profile of the company by Bloomberg, Huabao supplies flavours and fragrances for tobacco, food, and other household products. Huabao also provides research, development, and marketing services to its customers. Robin Li is the co-founder of Chinese online giant Baidu.com. Baidu was founded in 2000 and is now the largest Chinese search engine and gets the lion’s share of local search queries. Li is one of China’s richest men and Forbes estimates his net worth at $11.1 billion as of October 2013. Li has had experience working at several US websites including Infoseek and Go.com. While there are many billionaires in Asia, many of them inherited their fortunes. A lot of them were able to grow their inheritance and become notable business figures in their own right. The five billionaires on this list, however, stand out because they started companies by themselves, were able to expand those, and reap the rewards of their hard work. Also worth nothing is Huabao International’s Chu Lam Yiu, who is the only female in our short list of young Asian billionaires. Yoshikazu Tanaka, Fang Wei, Ma Huateng, Chu Lam Yiu, and Robin Li are self-made billionaires that have been featured in Forbes’ list of young Asian billionaires. They serve as inspiration to entrepreneurs who may not have been born with a golden spoon but are determined to build their fortune through sheer hard work. It’s also remarkable how many on this list are from China, serving as a testament to how the country’s economic policies allow entrepreneurs to become not just millionaires, but billionaires. *This guest post is written by Israel Defeo. He is the writer and online promoter of the leading financial comparison website in Hong Kong, Money Hero. The online portal presents up-to-date and unbiased information about insurance companies, credit cards, loans, deposit accounts and broadband and mobile plans. I stumbled upon a site where the author wrote on her journey towards creating her dream job in less than a year. This blogger blogs about her travel experiences and is now ranked one of the top 50 travel blogs in the world. She quitted her job 5 years ago to pursue her passion in travelling. She has travelled extensively to many countries and then subsequently created her site www.justonewayticket.com. 5 years ago, she didn't know if she would have enough money or if her passion in travelling can become her career. Now, she has successfully become a travel blogger with tourism agencies inviting her to explore their countries, hotels offering her free rooms in exchange for reviews and even airline companies offering her sponsored tickets to fly. The truth is, she's earning much lesser than what she is earning last time but it's enough to pay for her accommodation and food. To be exact, she was earning 10 times more previously and had a nice apartment, a car and many other things. But she wasn't happy going to work everyday and counting the hours until it was time to go home. There was a video being shared on her blog which i found it really meaningful. Many people chase after money and material possessions but end up being unhappy. This video is titled "What if money was no object". It talks about living out your passion and turning it into your life. Many local financial bloggers talk about achieving financial freedom early so they can pursue their passion and work lesser hours per week. In fact, successful people also talk about pursuing their passion and you can actually turn your passion into your career. When they pursue their passion first, they end up being successful and money comes after that. 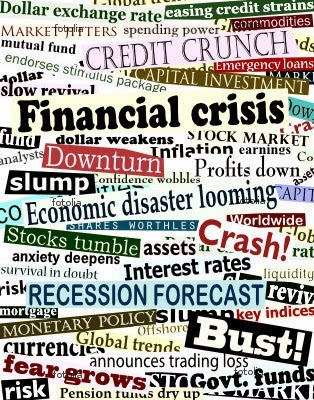 The 2008 global financial crisis was one of the worst crisis after the great depression. Singapore's economy was also hit with a contraction of -6% to -9% in 2009. Resident unemployment rate was at 4.3% in 2009. Economic policies have changed over the years from the pre great depression era to the post 2008 global financial crisis era. In my current year 3 economics module in university, I'll be learning all the different economics school of thoughts from pre 1900s to post 2008. This is rather interesting to me as I can learn what caused the various crisis some to be more severe than the others and what was done to bring the economy out of the recession. The great depression was so great that it was said to be one of the causes of world war 1 and 2. It was debated that had the governments back then implemented the right policies to bring the economy out of depression, the two world wars would not have happened. After the two world wars, we experienced one of the greatest economic booms in history. The new economic school of thought, which was known as the Keynesian economics, brought the world out of crisis and into economic prosperity. It was until in 1979 where the oil crisis took place that brought the economy down again. This crisis was caused by shocks to the supply of oil and was different from all the past crisis. Governments used the old economic policies to try and bring the economy back to recovery again but this time it caused other problems. Inflation was born out of the oil crisis causing prices worldwide to accelerate. Hyperinflation was seen in some countries This was partly caused by the wrong policies that was implemented after the 1979 oil crisis. The 2008 global financial crisis is something new again. This time it is global and the crisis is seen in almost every part of the world. There is already new research on going currently, which is known as the post Keynesian economic school of thought. This is still rather new and it'll be interesting to watch the developments of that theory. Having said all these, one have to realise that economic policies are one of the most important factors to a country. Without stable policies, the country will always be in trouble with high inflation and also high unemployment. There's this video which was broadcast shortly after the 2008 financial crisis. The video consist of interviews with people who were affected by the crisis and also an interview with Singapore's finance minister. The interview talks about the various policies the government will embark on and how to bring Singapore out of the crisis itself. It is definitely not by chance that we could still be here today after the crisis. This post is titled the world's richest city. The city is actually Singapore. In the following video, you will see how the rich have benefited from the prosperous economy of Singapore and in contrast, how the poor are struggling in life. A yacht that cost $5.2 million dollars? 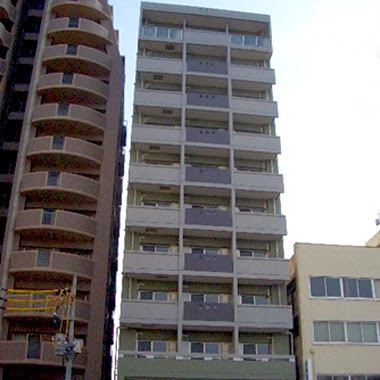 A prime property called the sail in the heart of CBD? A middle income worker have to pay housing loans monthly up to the age of 60 plus? A housing estate where 6 in 10 people are unemployed? A poor family surviving on $600 a month? The media is filled with images of how a wealthy or rich person lives his or her life. Big houses, big cars, branded goods are what we commonly see. Often, luxurious items are associated with rich people. To the extent, many people pursue all these luxurious items thinking that the more they own all these, the richer they are. Nothing could be further from the truth. In Singapore, we've heard of the 5Cs. They are Cars, Condominium, Credit Cards, Cash and Country Club. This is again associated with the rich and people believe that owning all these will categorize them as rich people also. However, pursuing all the luxuries of life can instead make a person poorer. A person can be living in a condominium, drive a big car and still be poor. It appears that they are rich on the outside but on the inside, they are actually mounted with huge amounts of debts. This in my opinion is not how a wealthy person is like. In this post, i'll be listing down 7 factors that differentiate rich people from normal people. What is the true meaning of being rich and how you can be happy being rich? Have you heard from your parents that rich people have many troubles and that being rich is not a good thing after all? This is true only for the "fake" rich. The "real" rich are happy and contented with what they have. 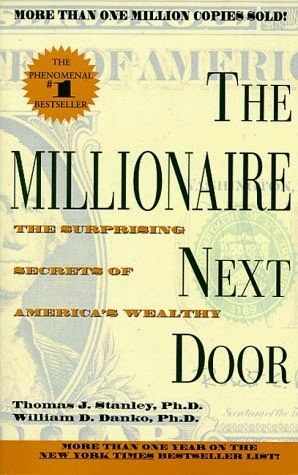 There's a book titled: "The millionaire next door". In this book, the authors had done extensive research on the majority of rich people in America. In this case, the rich people are defined as having a net worth of more than US$1 Million. What they found out was a surprise to many. Most of the millionaire households that they profiled did not have the extravagant lifestyles that most people would assume. This finding is backed up by surveys indicating how little these millionaire households have spent on such things as cars, watches, suits, and other luxury products/services. How these people manage to accumulate so much wealth is discussed in this book also. Here, i'll discuss 7 factors that made these people rich. This is what we've heard before. You might have heard it many times and know what it means. However, it is important to practice it. Rich people are frugal and live below their means. They save a huge part of their income and live a simple life. This is true for Americans and also true for Singaporeans. 1. Are your parents frugal? 3. Is your spouse frugal? The answer is also yes. It seems like the whole family is frugal. Frugality runs in the household and this is one of the factors that made them rich. However, being frugal alone will not make you rich. That's when the next factor comes in. Rich people like to learn. They invest a lot of their time reading, learning from others, upgrading their skills etc. It is stated that the wealthy people spend on average 8.4 hours a month on wealth accumulation and their investment strategies. On the other hand, normal people spend only 4.6 hours a month on wealth accumulation. There's an interesting fact that was mentioned in the book. It was said that wealthy people go out and earn income early and fast. This means they start working early and do not spend too much time in school. In fact, the authors shared why they were not rich. They said they had spend too much time in school with an average of 10 years in University. For a person who has started working 10 years earlier than you, it is impossible to catch up with his earning capacity unless of course they are able to earn an extraordinary high income from being an entrepreneur. Wealthy people use at least 15% of their income for investment. They are also interested in the value that they get when they spend their money. They will know where their money is spent on and keep track of their expenses. In the case of a car, wealthy people know that if money is spent on a car, the value of the car depreciates in the first 3 years. 3. 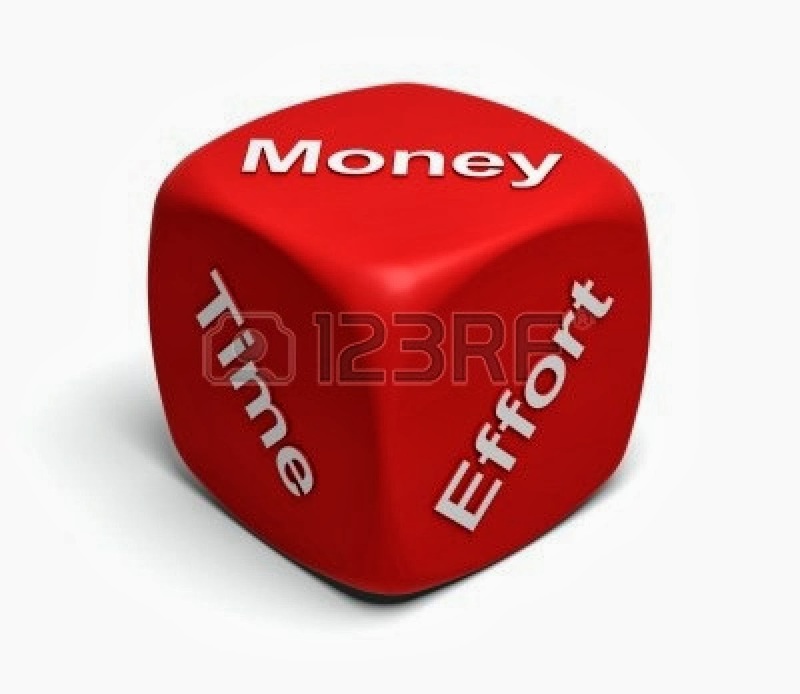 When it comes to the allocation of my time, i place the management of my assets before my other activities. Wealthy people agree to all three statements while normal people disagree to all the three statements. Cars are often associated with social status. The more luxurious car you drive, the higher your social status. Wealthy people in general are not concern with having high social status. They drive the normal family cars only. Most of the rich invest in properties or stocks of good companies. These investment generate cash flows for them and they get even richer and richer. When the extra cash comes to them, they don't go and spend on all those luxurious items. They instead invest back the money and let it accumulate more. Another important point is the rich enjoy what they are doing. They love their job, their work and their business. They often do not work for money any more. Whereas for the normal people, they work for money to support their spending habits. They may have high income but all their income is spent on keeping up their social status. They buy branded goods, drive luxurious, wear branded watches, live in high end apartments etc. Do you know someone like that? I bet you do. So decide do you want to look rich? Or do you want to be rich? Most millionaires are self made. This means they made their first million by themselves without any financial support. On the other hand, those who appear to be rich have a lot of finances from their parents. These young people who have all the luxuries in life have money from their parents. Their parents thought that by giving their children all these, they could get a financial head start in life and be successful later on. However, they are wrong. These kids will become financially dependant instead of independent. They always want to rely on someone else and think that their parents wealth are their wealth. The more money adult children receives, the less money they accumulate. The less money adult children receives, the more they accumulate. You can strike a million dollars or you can make a million dollars. Which would you want? The wealthy people want to make their millions instead of strike it. Making their first million let's them value the money more and also experience the process of making it. They can go on to make their second and third million if they want. It becomes easy for them. Those who strike it either squander it away or mismanage it. It can become disastrous for them. 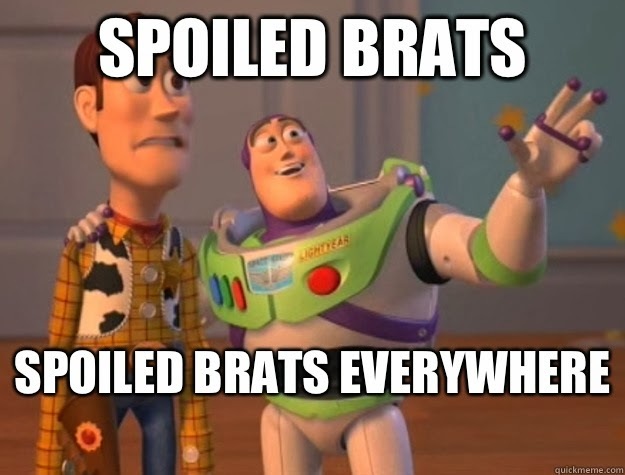 Children from rich families are spoilt brats. That's what we often heard. During my secondary school days, i had a friend in my class who was really rich. His dad bought him a condominium at the age of 13. His allowance was $50 a day which makes out to $350 a week. His parents gave him everything including all the latest gadgets which he would bring to school to show off. I was really envious of him that time. I was only getting $40 a week in allowance and thought how good it would be if i had his money. However, this friend of my had a very sad ending. He was really bad in his studies and failed almost every subject. He was frequently into gang fights and stole things from shops as a challenge with his friends. In the end, he was expelled from school and was caught for involving in gang fights and stealing. I have no idea where is he now. My rich friend's parents might have a high income but they are not the truly rich people. These are the so called look rich people. The real rich people will have children who are financially independent. They are not given everything they want when they are young and are taught the importance of living a frugal life. They grow up to be sensible and independent adults. Rich people are constantly looking for opportunities. 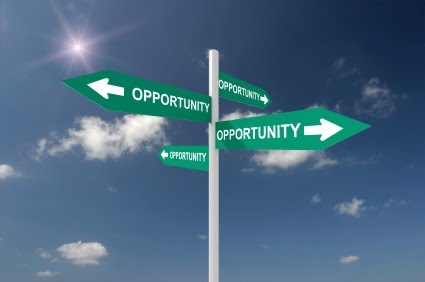 Opportunities to do business, opportunities to invest etc. When they invest, they make good investment decisions and manage to grow their money consistently. This has to be tied to the time and effort they spend on managing their finances and researching on investment strategies. This is very important. Rich people know what they want in life. They know their passion, their strengths and weaknesses. They know what they are good at and excel in that area. Choosing a career can be the most important choice of our lives. While many normal people live through life motionlessly from pay-check to pay-check, rich people excel in what they do and they love what they do. This sums up the the 7 factors that differentiate rich people from normal people. As stated earlier, rich people have accumulated a net worth of more than US$1 Million dollars. The next time you look at a "rich" person who lives a luxurious life, see carefully if he or she is really rich? Is he or she deeply in debt? Can this person sustain his or her lifestyle if he or she stops working? 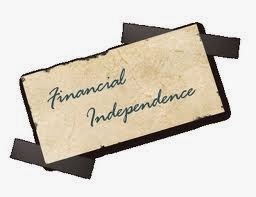 The path to true richness is the path of financial independence. When you reach financial freedom, you can choose to stop working and still can sustain your current lifestyle. When the time comes, you are not a slave to money any more. That is when you can live a free life not bonded by the worries of finances. It is possible for everyone to achieve that. Learn from the "real" rich people today! Precious metals are naturally occurring metallic compounds of high economic value because of their rarity. Gold bullion is the more popular precious metal that is frequently selected by investors because this precious metal is often used as a hedge or harbor against economic uncertainty. Bullion is a bulk form of gold, and gold bullion is frequently traded on prominent commodities markets. Gold bullion can be traded as a commodity that is significantly affected by the central banking industry and the international monetary fund, for example. Gold bullion bars can be used as hedging products against inflation. Buy gold online through professional precious metals dealers to begin a precious metals portfolio. Buy gold bullion as a precious metals investment. This type of investment is tangible and is often more attractive to individuals who wish to have their own access to an account. Gold can be easily used as a purchasing agent. An investor can use their own storage facility or may use a safety deposit box at a local bank, for example. 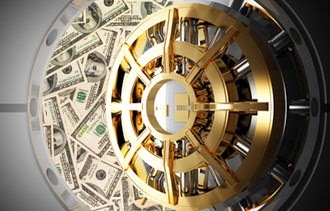 Insurance is available for an account that is stored by a professional gold dealer. Learn about the online dealer and the services offered. The quality and characteristics of the gold bars purchased are critical to understand. Gold purity is an important characteristic of a gold bullion purchase with higher purity levels being more valuable. Be sure the gold is genuine by using reputable dealers who sell only legitimate products. There are several makers of gold bars that use a valuable hallmark that identifies a genuine product. Check the spot price of gold to make sure that the sales price is appropriate. Contact an investment company directly in order to sell a gold bullion bar. Auction websites can help a gold investor sell a certain amount of gold bullion. A local jewelry store may want to purchase gold in order to manufacture new jewelry. Pawn shops buy gold bullion for lower pay outs. Gold is used as an additional account for an investor's portfolio. The value of gold has its own economic markets, and frequently the value of this yellow metal does not decline when other markets fall. This precious metal is used as a hedge against unstable economic markets and a harbor against inflation. There is a tangible value to this type of investing that is attractive to investors wanting more direct account access. Buy gold bars for long term retirement investments. Buy gold online through reputable broker dealers. 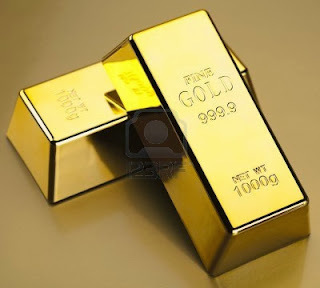 Note the quality and characteristics ofgold bars prior to purchase. Investment caliber bars are stamped with a maker's hallmark and have a certain percentage of gold purity. Gold bullion bars can be safely stored. *The above article is contributed as a guest post by Aew. Gold is a long term investment. It is a hedge against inflation. When the value of paper currency depreciates, Gold becomes stronger as what we've seen over the years when the US dollar depreciated. Gold prices has fallen significantly over the past 1 year and may continue to fall as the US dollar get stronger due to the fact of the tapering of QE. It may be good to watch gold prices as it develops. There will certainly be chances for patient investors to buy Gold at cheap prices. In Singapore, you can invest in Gold through the bank. UOB allows you to open a gold/silver account or you can buy the physical gold itself. Contact a professional advisor to know more about investment in Gold Bullion. Previously, i've blog about my Taiwan trip where i spend only $705 for 8 days. I'm an avid traveller who loves to plan my own free and easy travel in a simple and budget way. This kind of travelling adds a little spice of adventure and makes it more interesting compared to the usual luxurious travel. I can customise my tour and choose to travel only to the places that i want. This is a post on my North Vietnam trip in 2012. Places visited consist of Hanoi which was the first stop. Halong bay is the next with a 2 days cruise trip and on to Sapa, which is a mountainous area with beautiful terraced rice fields and minority tribes villages. Vietnam is a place of unique culture. There is an unspeakable peace and tranquillity in the country itself. Ever since i visited Vietnam for the first time in 2007 during my student internship, i could never forget this country and the experience i have there. This trip was rather easy to plan as i engaged the service of a local Vietnam tour agency to customise the tour for me. 1) In Vietnam, taking the bus is rather inconvenient. However, you can take the taxis as its very cheap there. But remember that only a few taxis companies can be trusted. If possible, arrange for airport pick up service with your hotel. Once at the hotel, check with the hotel staff which taxis to take. They can help you to call for taxis too. It's free of charge. 2) Vietnam has many local tour agencies. The tour agency that i engaged was by Vietnam Awesome Travel. This travel agency is also recommended by tripadvisor. I personally think their service is quite good as they are willing to customised the tour for me. You can email them and their response is quite fast. Payment is only made when you're there on your first day. No deposit required. 3) That's all there is to plan for a North Vietnam tour. It is that simple and easy to plan. Here are the details of the whole trip including my itinerary and accommodation places. Travel to Hanoi via Singapore Changi Airport Terminal 1 by Jetstar. The tickets if i didn't remembered wrongly was about $200 per person. Travelling date was somewhere on the third week of December very near to Christmas so i guess the plane tickets were a little more expensive. Arrived at the airport and hotel staff was there to pick us up. I had arranged this service beforehand with the hotel. Thought that this would be a good choice since i got cheated by taxis in Vietnam before. Lesson was learnt. The hotel we stayed in was called Hanoi charming hotel. Cost was only USD23 per room per night. Quite affordable i would say. It's a rather small hotel in one of the small alleys in Hanoi. Without the airport pick-up service, i don't think i'll be able to locate the hotel myself. Staff were very friendly in the hotel. Most of the hotels i stay in Vietnam have friendly staffs. This is my experience so far. Hotel rooms were clean and everything was in good condition. They have air con with heating capabilities. This is needed when weather turns rather cold especially in December. There was one night it was only 9 degrees Celsius. Travel to Halong Bay in the morning for a 2 day one night cruise in Halong bay itself. The journey to Halong bay from hotel took about 4 hours. Once we reach there, the view is stunning. I can see many small mountain like structure protruding out of the bay. The cruise we took is Dragon cruise. As we set out on the cruise deeper into the bay, the view is even more refreshing. If you visit North Vietnam via Hanoi, be sure to visit Halong Bay. It is definitely worth the trip. Halong bay is also one of the UNESCO world heritage site. For the 2 days one night, the cruise will bring us to different tourist attractions in the bay also. We visited caves, fish farms and even had a kayaking session in Halong Bay. The waters there are very calm so it doesn't cause any sick sick feeling or whatsoever. All meals are provided on the cruise itself. On day 3 afternoon, the cruise came back to land and we were driven back to Hanoi to prepare for the night train to Sapa. The train is a sleeper train which means there were beds in the cabins. Journey from Hanoi to Sapa was around 8 hours. Its quite a bumpy ride as I think the trains there aren't so advance. Its quite a old traditional train which you'll only be able to see in the 80s. Overall it was a good experience. The exterior of the train. Very old and traditional. On day 4 morning, we arrived at the train station near Sapa. There was a mini bus to take us up to the mountain areas. The drive was about 1 hour plus if I didn't remember wrongly. When I got out of the mini bus, the first thing I noticed was the cold temperature. It was so cold and I didn't prepare myself adequately. We went straight in to the hotel lobby for checl in and breakfast. Luckily there was heater at the hotel lobby. 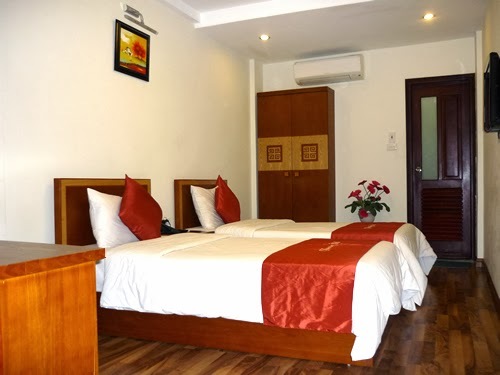 This hotel is called Dang Trung hotel. It was a french style building. The only bad thing about this hotel is there was no heater in the rooms! So its not recommended during very cold seasons like December. They only had electrical heat mats on the beds and a fireplace. These had to be purchased at additional cost. I think the fireplace is quite cool though. I purchesed some wood and burn it in the fireplace in my room. But the cold was still so bad that after awhile, the heat of the fire faded off. I forgot to mention the temperature. It was 3 degrees Celsius at the lowest. Can you imagine living in this temperature without a heater? Totally unbearable. Of course at night will still be able to sleep with the heated beds. The whole of day 4 was spent on tracking into the terraced rice fields. The simple life, the ragged terrains were all worth the tracking. We tracked for almost 5 hours. Walking and admiring the sceneries as well as the simple life of these minority tribes in Sapa. The tracking is tough and some roads are muddy. You'll need a certain level of physical fitness to finish it. Do take note of that. There was a village we went to where I saw many kids playing in the fields and they were all dressed in torn and dirty clothes with mud all over their body. However, they seem so happy and enjoying their fun. Its a joy to see this sight. It was Christmas day! More tracking but this time its to a nearer village. Only 2 hours walk on normal roads. After that we went back to Sapa town and visited the local market plus spend the rest of the day relaxing in the hotel rooms as we were exhausted from all the walking. After having enough rest, we went out at night after dinner to take a walk. There were some performance at their small local church and crowds were gathered there. We joined in to watch the performance and listened to the Christmas carols. Standing out in the cold and listening to the carols makes it really feel like Christmas. Later at night, we walked back to our hotel. On the way back, there were some street stalls selling barbecue items. It was really tempting to have some barbecue in this cold weather. We gave in and set down beside the charcoal stoves for some barbecue chicken wings, satays etc. After that, we went back to the hotel and the hotel owner was kind enough to offer us some red wine. We set at the lobby sipping the red wine and talking to the hotel owner. Everything just feels so much like Christmas. It was definitely one of the most memorable Christmas I ever had. In the morning, the mini bus came to pick us up after we checked out hotel. This time we're going to another local market. In this market, they sell everything from live chickens, to dogs to horses to buffaloes. All were on display there for people to choose. Its a rare scene which I'll never be able to see in Singapore. Oh and North Vietnam sells dog meat too. Its everywhere in their markets so do not be surprised by it. I guess its legal for them to eat dogs. After the market trip, the bus took us to another village at a lower part of Sapa. In the evening, we took the night train back. Same sleeper train to spend the night on the train. Arrived back in Hanoi early in the morning at about 5:30am. A person from the travel agency came to pick us up and drove us back to our hotel. I stayed back at Hanoi charming hotel. As it was not check in time yet, we could not check in but the hotel staff was kind enough to let us have a room in their sister hotel just across the street so we could get some rest. Spent the rest of the day in Hanoi. Had some seafood at night there. Spent the rest of the day in Honoi before proceeding back to airport for our flight back to Singapore at about 4pm.